The new Mac mini is 7.7 inches square and 1.4 inches thin. It might not have been announced with the fanfare that accompanied the launch of iPhone 4, but for many musicians, Apple's new Mac mini will be a far more desirable piece of hardware. An update to this pint-sized desktop computer has been rumoured for months; the only surprise is that it seems to have been ushered out of Apple's back door while the company's PR department was on holiday. 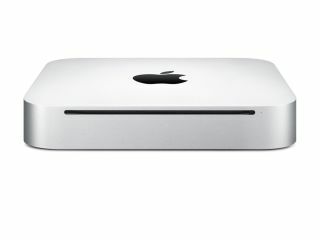 The headlines are that the new Mac mini is smaller (it comes in a compact aluminium enclosure); has twice the graphics performance (NVIDIA's GeForce 320M is onboard); and sports a new HDMI port and an SD card slot. £649/$699 gets you a 2.4GHz Intel Core 2 Duo processor, 2GB of RAM and a 320GB hard drive. Musicians will be pleased to learn that there are four USB 2.0 ports and - hurrah - a FireWire 800 port, though if you don't want to connect up an audio interface, you can make use of the built-in audio I/O. There's also expansion potential: up to 8GB of RAM can be installed and you can have up to 500GB of internal hard drive space. Our immediate impression is that, if you're looking to replace your old G5 and already have a monitor, mouse and keyboard setup that you want to keep, the new Mac mini could be a strong option, and you might also consider it as a second computer that you can connect to your HDTV. This launch also serves as a refreshing reminder that Apple still actually makes computers - a fact that, in the iPad/iPhone hype-storm that's been blowing around for the past few months, some people seemed to have forgotten.